That summit area looks really cool! Neat rocks to climb around on. The environment is so different from the Pacific NW. Jennifer, I can't wait to hike in your neck of the woods -- I'm sure I'll love the trails of the Pacific NW! I just discovered you last week, listening to WBUR, Radio Boston. This is fantastic stuff. I am off to get your book ASAP. Funny, we hiked Mt. 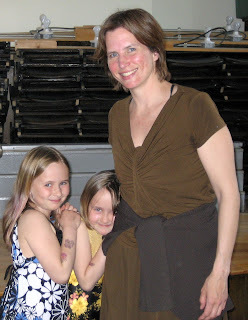 Cardigan with our 7-yr-old and 3-yr-old on Mother's Day. It was great, but the mayflies were out in full splendor (or, not-so-splendid, ugh). I also hail from the Pacific NW, having conquered the famed West Coast Trail as an 11th grade PE project. But I LOVE NH trails. I am completely inspired, can't wait to read more! I especially like the last picture - mostly because I am sort of in it ;) Looks like you all had a great hike! We took a much longer time to do the same loop for our training, but lucked out with similarly beautiful weather! Thanks for your kind comments and support! I just checked out the West Coast Trail on the internet -- wow, what an amazing journey you must have had! That trail looks gorgeous!! Mt. Cardigan is a lovely mountain, I'm glad you enjoyed it. Sorry about the blackflies -- they should be fairly manageable in another couple of weeks. Maybe we'll see you out there on the trails sometime!